Perched on a cliff 200 feet above the mouth of the Columbia River, the Lewis & Clark Interpretive Center tells the story of the Corps of Discovery’s journey, focusing particularly on their Pacific Coast stay. It’s a wonderful stop for families with interactive exhibits. Children can try to pack a canoe without tipping it, follow a treasure hunt, and check out what the Corps ate on their journey. During winter and spring, trained volunteers come to the center to help visitors spot migrating Gray Whales. 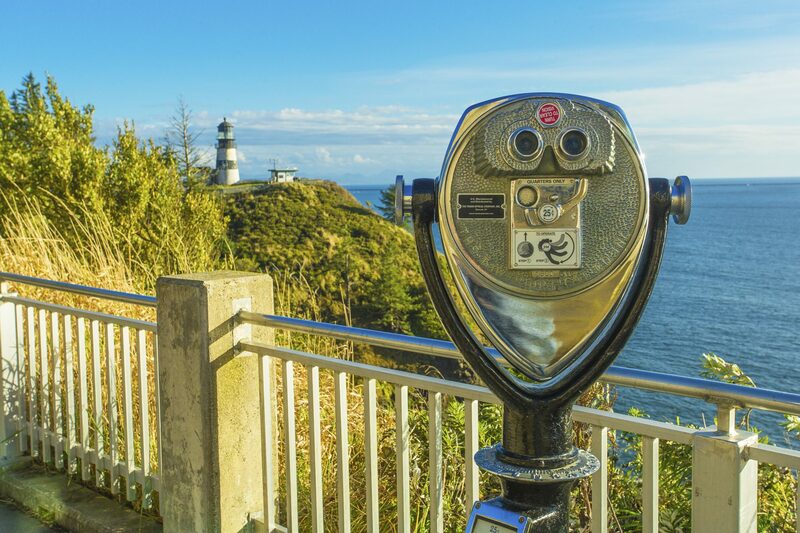 You can also learn about the nearby North Head and Cape Disappointment Lighthouses. The Cape Disappointment Lighthouse is the oldest operating lighthouse on the West Coast. The lighthouses both function to protect mariners from the rough and ever-changing Columbia River Bar in the treacherous area known as the Graveyard of the Pacific. The Park is open year-round for camping and day use, 8 am to dusk. A Discover Pass is required. The day-use pass is $10, and the annual pass is $30. The Discover Pass is valid at all Washington State Parks. Washington State Parks like Cape Disappointment, Fort Columbia, and Leadbetter Point require a pass for parking. Take in panoramic views at the Lewis & Clark Interpretive Center. Photo by Walter Dorsett. April 1 – Oct. 31, open daily 10 a.m. to 5 p.m.
Nov. 1 – March 31, open Wednesdays through Sundays 10 a.m. to 5 p.m., closed Mondays and Tuesdays. Admission is $5 for adults 18 and over, $2.50 for children ages 7-17, and free for children 6 and under. For more information call (360) 642-3029, or learn more about Cape Disappointment State Park here.